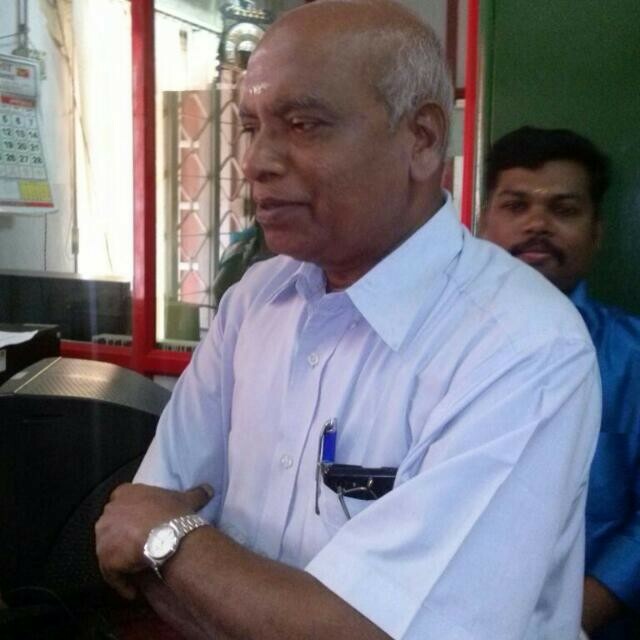 2015-05-24 ~ National Association of Postal Employees, Tirunelveli Division. நமது தேசிய சங்கத்தின் முன்னாள் மாநில துணை தலைவராகவும் நமது கோட்ட தலைவராகவும் பணியாற்றிய நமது வழிகாட்டி திரு S .பலவேசம், POSTMASTER தக்கலை HO அவர்கள் இன்று 30.05.2015 அன்று பணி நிறைவு பெறுகிறார்கள் . அவருடைய ஓய்வு காலம் சிறக்க எல்லாம் வல்ல இறைவனை இறைஞ்சுகிறோம். 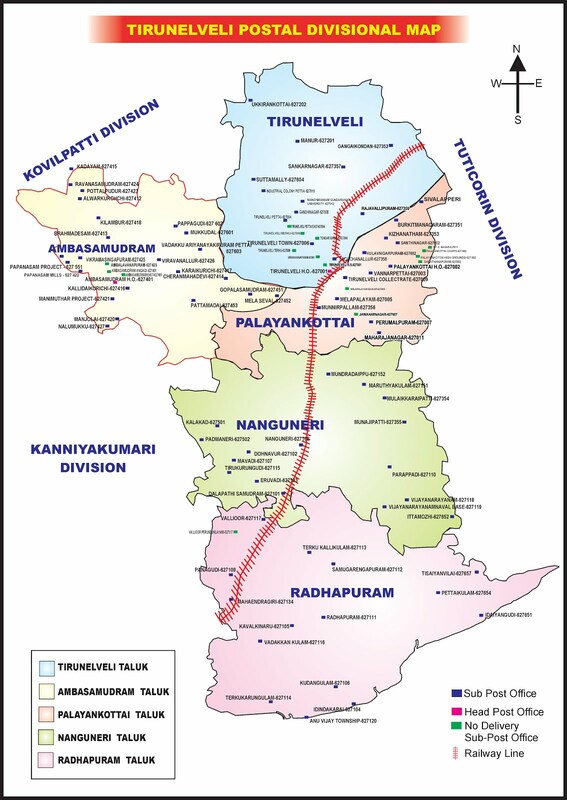 விரைவில் LGO தேர்வு முடிவுகள் வெளிவரும். 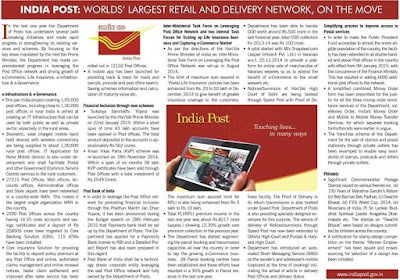 NEW DELHI: The Department of Posts (DoP) is likely to soon start a Rs 1,370-crore mega project that will allow India's 1.3 lakh postmen in rural regions to use network-connected handheld terminals for postal delivery. Big IT companies such as HP and Wipro were also in the running for the contract rolled out by the ministry of communications & information technology. "Based on terminal devices on network, the DoP initiative is likely to happen later this month. The project was delayed as the private company took time to deliver the components," TCIL's chairman and managing director Vimal Wakhlu told ET. The devices will have a biometric module to authenticate an individual's identity using the Aadhaar number, solar-powered panel for charging terminals and a thermal printer to instantly print receipts. "This is completely an indigenous project, including devices and components, and strengthens the concept of 'Make in India'," said Wakhlu. The initiative is aimed at preventing postal losses and minimising procedural delays. The service will require a digital signature of the addressee that can be automatically transferred to a central server and an acknowledgement sent to the person. TCIL is roping in state-owned telecom operator Bharat Sanchar Nigam Ltd for providing network connectivity. The movement of postmen can be tracked using GPS on this device. It will help monitor the entire system and ensure more efficiency as post offices play a vital role in India's rural economy, Wakhlu said. "This programme is a step towards financial inclusion of the people of rural India as it will facilitate financial transactions. Money can be delivered and accepted through this device, with proper bank account and receipts delivery," he said. Ricoh will act as the systems integrator, managing installations, maintaining hardware and supplying peripheral devices for the project. "We have won the Rs 1,370-crore contract from DoP for the supply of hardware solutions under the department's modernisation initiatives. Ricoh will be providing maintenance services for rural ICT devices for a period of five years," said Ricoh India's managing director Manoj Kumar. Outward clearing procedure involves at Sub office and Head office level. Entering the insturments by using the menu option HOMSO in counter PA login. Verification of the instruments which are lodged by counter PA using the menu HOMSO in supervisor login. The following steps are involved in HOS for handling both SOs cheques and HO cheques as mentioned below. Invoke the menu HPR to select the generated file, click on the icon and view the file path. Download the files at HO by using the menu HTRFTOPC i.e., enter the file path and destination path where we want to save in our PC(computer). நெல்லை கோட்ட தலைமையிட உதவி கோட்ட கண்காணிப்பாளராக - ASP (HQ) திரு உதய் சிங் அவர்கள் நியமனம். On November 3, the DOPT issued an order regarding the adding of Aadhaar Number in the Service Books of Central Government employees. The order also contains certain important instructions in the rules and regulations regarding the Service Book. According to Rule SR-202, every year, the Head of Office has to get signatures from all the employees affirming that their Service Books have been updated. According to Rule SR-199, all the work-related remarks and notes of the employee have to be recorded in the Service Book. Each remark and note has to be attested by the senior officer. According to Rule No. 32 of the CCS (Pension) Rules, 1972, all the employees who have completed more than 18 years of service will have to be informed of the retirement and pension benefits. The Order adds that the Service Book must also contain information like the employee’s biodata, posting details, qualifying service, security details, HBA, CGHS, CGEGIS, LTC claims, etc. And now, all the Ministries and Departments have been asked to add the Aadhaar Numbers of the employees to their Service Books. Service Record book have to be created for an employee on the day he/she join duty. Each employee must be given a copy of his/her Service Book. In case of misplaced, for additional set of copy, the employee has to pay a fee of Rs.500. The Service Book must also contain important details of his/her life, like the employee’s marriage, children, death and address. Why should Aadhaar Number be added to the Service Book? Central Government offices in Delhi now have Biometric Attendance system. The Government has plans to implement this system all over the country. The first step in this ambitious plan is to add the Aadhaar Number to the Service Books. Names are creating confusions ensue due to same initial, dates of birth and other such details. This could be avoided if each person is given his/her unique identification number. All the details about the employee can be easily gathered from the number alone. In future, Aadhaar number becomes more important than a person’s name! The latest order issued by the DOPT has demanded reports from all the departments on how far they have succeeded in implementing the previous order. 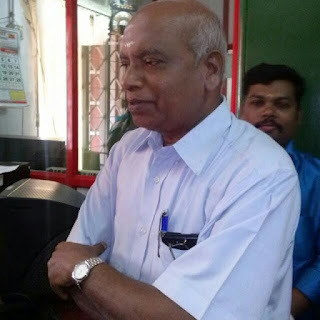 There is nothing illegal about government servants being placed under suspension on the last day of their service, the Madras high court has said, refusing to quash the suspension of a civil supplies officer on the eve of his retirement. Justice S Vaidyanathan, dismissing the petition filed by V Murugan, who was slapped with five charges a few days ahead of his April 1, 2015 retirement and placed under suspension on March 30, said: "There is no hard and fast rule that an employee cannot be placed under suspension on the last day of his service. If the prayer of this petitioner is allowed, then persons like him may commit misconduct during the last month of their service and take a plea that no charge memo or suspension order can be levied against the employee." As long as there is an employee-employer relationship, the employer has got every right to issue charge memo and place the employee under suspension and proceed against the employee as per rules and regulations, Justice Vaidyanathan said. Murugan challenged validity of charge memos dated March 6 and 27, and the suspension order dated March 30. He wanted the court to quash the orders, and direct the authorities to extend all monetary benefits, pending salary, leave benefits and all other terminal benefits with continuity of service to him. The department, however, submitted that Murugan was issued charge memos in the first week of March, 2015 and one day prior to his retirement, he was placed under suspension. Noting that the regional manager of Tamil Nadu Civil Supplies Corporation was competent to issue suspension orders, it said one of the five charges against Murugan was that even without attending the office he signed the attendance register. Justice Vaidyanathan, asking the authorities to review the suspension order periodically, said the authorities could issue him a chargesheet and complete inquiry "as early as possible, preferably within one year." It is also open to the authorities to conduct the inquiry proceedings on day-to-day basis, he said.